I only had the chocolate ones. 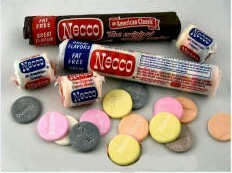 Love 'em me NECCO's. Got these when we went Trick-Or-Treating. Usually traded them away for other candy or threw them out. They are selling a pack now that contains different flavored waffers and it is hard to find the original packages now.. the mixed flavors and the all chocolate ones. Also hard to find FRESH packs, lots of times they are pretty stale! I hope I don't stumble on to anyplace that sells these.... I'll buy 'em all! About two weeks ago I was driving to Logan airport, and passed the factory. I remember Dad eating these, but I was never a big fan, and was surprised to see the big logo as I drove by the plant. I Loved these as a kid, even my mother would buy them to satisfy a sweet tooth. Thank You for posting this. NECCO stands for New England Confectionary COmpany, and the candy is still made in New England -- specifically, in Revere, Massachusetts. The candy with words mentioned in the above post is probably the Sweethearts line, also made by Necco; it is offically described as "Conversation Hearts," and is available mostly around Valentine's Day (in other words, right after Christmas! ).